Becoming a Distributor of Daley's Fruit Trees is easy all you need is to be a registered retail nursery and have an ABN and be able to order wholesale quantities. Minimum quantities of 1/2 Tray lots per variety and minimum 4 trays in total apply. Wholesale is a secondary side to our online mail order business but we do still supply a small range of trees for wholesale, the availability will very throughout the year, log in to check our wholesale list at any time. Request a log in password through our contact page and then use the link we provide you with to log into to our online wholesale site. Our website shows you up to date quantities of stock and will calculate an estimation of the freight charges. Orders must be placed in half tray lots, you may add items from our retail list at retail prices if you wish. The team at Daley's propagate an extensive range of subtropical fruit and nut trees that are ready to leave our nursery and grow into productive healthy trees. We recognise that to be able to supply you with such a tree it needs to be young and healthy as opposed to root bound and lifeless. The health of a tree is in the condition of its roots, and we guarantee that the trees we sell have a young active root system therefore becoming established faster and reaching their full potential as quickly as possible. We are able to achieve our continuous high standards by using our own blend of quality potting mix, ensuring a high stock turnover and expertise in propagation methods. As a member of the national and state Nursery Industry Association we are committed to the continued promotion and excellence of this industry. Our Quality Assurance and control systems are second to none. As a green industry we practice environmentally sound management and have sound IPM (integrated pest management) strategies in place. Through several stages of potting up plants, from tubestock to pot we ensure a strong and healthy root system. We use a very high standard potting mix that is completely soiless and free of pathogens. Long term Slow Release Fertilizers added to the potting media will ensure optimum health and vigour of trees from us to your customer. 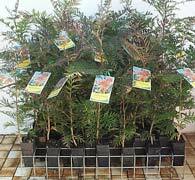 Size: We find that the optimum size of most of our trees in our 165mm pot is approximately 60-80cm. We also sell a wide range in a smaller 90mm mega tube, these plants are approx 30 - 50 cm tall and fit in a display tray which you may request to be included with your order. This height sits well on shelving, is easily transported and is easily handled by the customer when planting out. The plants are young and fresh and healthy ensuring that they push away well when planted and reach their fullest potential in a minimum period. For more information on the size of our other lines contact us or alternatively follow the photo tour of our nursery. Labelling and Staking: All plants are labelled with our Daleys Nursery descriptive slip on label, we provide a limited supply of pictorial but we do not keep a full range. We take great care in the presentation and labelling of plants, a proceedure which is monitored closely with our Quality Control systems. We understand that promotion and presentation is of the utmost importance. Since 1980 we have been establishing and building strong relationships with respected editors and horticulturalists within this Green industry. This has been a necessary part of our business success due to the fact that the 'subtropical fruit tree' industry does not have a specific organisation or body to help support it and build consumer awareness. Over the last three years we have noted a significant increase in interest. Fruit trees have again become the 'in thing' and are promoted significantly throughout media outlets including some of the most popular gardening shows. Dwarf citrus and fruit trees are also increasing popular and are ideal for container growing.